Don Smith (California, United States) on 12 June 2011 in Landscape & Rural. Full Moon Over Red Rock, Arches, and Canyons - 3rd Annual Arches/Canyonlands Photo Workshop - October 9-13, 2011 (Workshop Sold Out). Bryce Canyon Hoodoos and Zion Fall Color - 1st Annual Bryce/Zion Photo Workshop - November 1-5, 2011 (Workshop Sold Out). New Articles on my Website: Calculating a Moonrise Using The Photographer's Ephemeris. Hey gang, I have been posting daily images and tips on my Don Smith Photography Facebook page. Navigate on over and click the like button so you can follow my daily musings! Today's Image was from my recently completed Lake Tahoe and the Mokelumne Wilderness Workshop. If you have been following my recent posts, you are probably aware that we faced a series of winter storms that severely curtailed our location shoots. One evening, I strolled out behind our hotel just after the snow had momentarily stopped and was treated to this scene. I loved the drama of the clouds and light, and particularly liked how the pier led the eye through the frame. I call this flow. If you would like to read more about my thoughts on this subject, please read my story Utilizing Lines and Shapes to Lead the Eye - Creating Flow. Great compo & nice framed ! Don this is a great example of the use of lines to add depth to the image! The converging lines take me all the way through the frame! @Scott F. Schilling: Thanks for writing Scott - I always appreciate your comments. I look forward to seeing you later today. LOL...You're killing me here...My next post up is from this location (and I put it up in the queue over a week ago !). I like the tight crop and the graphic leading lines in this image...very cool. @Mike: Therein lies the result of shooting together! No worries, yours was completely different. Never ceases to amaze me how two photographers can stand side-by-side at a scene and the resulting image is completely different. @Pierre Joubert: Literally and figuratively! Smith, Nice crop, its a simple image and nice. Mike's just give it a little different perspective. @James Guillory Photography: For me, it's the simplethat makes for strong images. Hope you are staying cool this summer. This morning is the first one where I have awoken to sunshine! It has been clouds and fog for the past two months. Wow! Thant light really is amazing! I really liked your post on Flow, too...Always good lessons to keep in my mind! @Tracy: Like the old saying goes: an average scene under great light makes for a great image; a great scene under average light makes for an average image. Don this is so cool. The light and wonderfully reflected water on the left balances the dark (with almost a moonlight look to it) on the right - The snow-covered pier runs off into a definite abyss that sports a boat ramp as well....This is beautiful and really kinda scary......I may need to bail from AM3 for awhile..gotta finish that NYIP class and I am way behind thanks to work, the class, etc etc ....thinking about doing a 90-95% bail until the end of July or first part of August...But I will tap in when I can to provide my reverred comments....all the best sir...Now I am off to Mike's to look at his. If I don't talk to you best of everything in Hawaii and get some 100% Kona...you'll be glad you did! @Denny Jump Photo: Hey Denny, I'll miss your comments - they are always so well articulated. But I completely understand as time is precious for all of us. Good luck with your class and I hope to still be here when you return. I have started lengthening the time between my blog posts in favor of posting daily images/tips on my Facebook page. And yes, Kauai is coming up soon (3 more weeks) and yes - I know all about 100% Kona - some of the plantations are right down the road from where we are staying. Aloha for now my friend! I blew through the rest of the online written tests last night (got A- on two and B on the others) so now I "just' need to turn in the photo assignments (there are two of them but I have to wait for critiques etc. after each batch) so my time away may be a bit less than I expected. Even though I can't pick up FB from here at work - I understand where you are coming from...I will make a better and more conscious effort to follow you on FB and I am thinking of slowing down here too...Also I am going to go back and get out all the lessons from you that I procured and go through them again on a more deliberate pace...learning this craft is a slow steady one for me and I have absolutely awful retention...I have to learn by doing...comes with age..but I am just tired of having crumby shots and I have the best teachers in the world in you, Gary, Scott and others...so I have no excuse...Man I can taste that Kona now - ain't nothin like it. All the best Don! @Denny Jump Photo: Thanks for the high praise Denny and glad to hear you will be sticking around. And I agree wholeheartedly that a craft like photography is best learned by doing. However, I believe constant study and reinforcement of that study is needed to grow and expand. Bottom line - have fun with it. Even as a pro I have to constantly remind myself of that (perhaps more than amateurs). Keep the passion alive - that is where the best images come from. 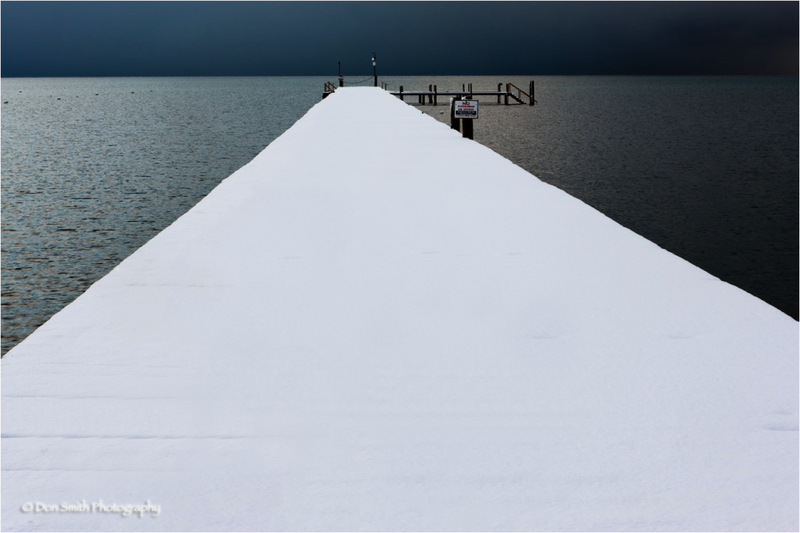 Magnifique cette photo , cette neige sur ce ponton avec ces couleurs ,c'est de toute beauté !! !